What Are the Origins of the Sasanian Empire? In the ancient world, three dynasties of Persian speaking peoples created vast empires across central Asia and the Near East: the Achaemenid (559-330 BC), the Parthian (ca. 247 BC-AD 224), and the Sasanian (AD 224-651). 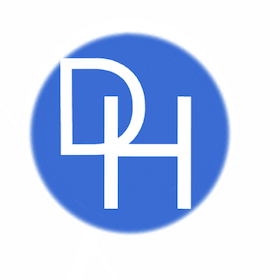 Although each of the Persian empires shared certain cultural attributes and a fair amount of geographical space, each dynasty was also unique and important in its own way. Stretching from the Indus River in the east to the Euphrates River in the west, and from the Oxus River in the north to the Persian Gulf in the south, the Sasanian Empire was every bit as large and powerful as its two predecessors. The Sasanians were known for following and codifying many of the Achaemenid and Parthian cultural and religious traditions, such as the rituals of the Zoroastrian religion in the collection of religious texts known as the Avesta. Like the Parthians before them, the Sasanians fought the Romans, and later the Byzantines, for control of Mesopotamia and ultimately lost a war for their very existence against the Islamic Arab armies, which signaled the beginning of Islam’s ascendency in the region and the end of the ancient Near East. But long before Islam overtook Persia, the Sasanians fought a war against the Parthians for control of the region. The Sasanians achieved their victory through a combination of superior leaders, tactics, and organization and despite the violent overthrow of the Parthian Dynasty, the transition from Parthian to Sasanian rule was incredibly seamless. The early Sasanian kings pursued a program of continuity with the Parthian and Achaemenid dynasties in their use and acceptance of religion, language, and history, which ultimately made the dynasty strong enough to resist outside forces. The Sasanian Dynasty originated in the region of Persis in southern Iran near the city of Istakhr. Unlike many royal dynasties, which are usually named for the first king in the royal line, the Sasanian Dynasty was named for a man called Sasan, who was the guardian of the sanctuary of the Persian goddess Anahita. Although the Sasanian Dynasty came chronologically just after the Parthian in Persian history, the former’s homeland was much closer to the Achaemenid homeland, which probably played a role in their later claims of Achaemenid descent. Ethnically and culturally speaking, despite coming from different origins, the Sasanians and Parthians both spoke the Middle Persian language and shared a number of other religious and cultural affinities. Before he defeated the Parthians, though, Ardashir I essentially encircled them by conquering everything around Mesopotamia, slowly moving his army from east to west. Once the conquest was complete, the king had to ensure a smooth military and administrative transition from Parthian to Sasanian rule. Although influenced by the Parthian army in its reliance on cavalry, Ardashir I transformed the powerful Sasanian army into a well-organized fighting force of up to 80,000 men. Companies of 100 men were the numerically smallest level of organization. Ten companies comprised a regiment and ten regiments formed a division. Essentially there was great continuity from the Parthian period in the Sasanian army’s reliance on cavalry, but the structure was much more complex. Despite the war that overthrew the Parthian Dynasty, there was a seamless cultural transition from the Parthian to the Sasanian Empire. Ardashir I and his successors used royal epithets made popular by the Achaemenids and Parthians and were devout followers of the native Persian religion of Zoroastrianism. 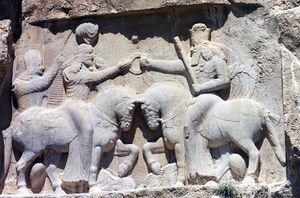 Ardashir I and his successor, Shapur I (reigned 240-272), centralized the Zoroastrian religion, essentially making it a “church,” by assigning men to make sure the proper rituals were being carried out and by codifying the rituals and myths in the Avesta. 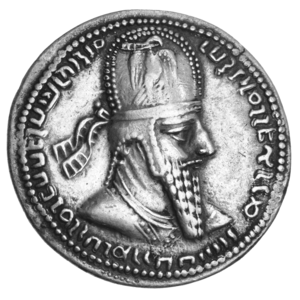 The high-priest of Sasanian Zoroastrianism was known as the herbad, whose responsibility it was to make sure the religion was being observed properly throughout the empire. The herbad under Ardashir I and Shapur I, Tanser, made sure that all of the minor kings and governors in the Sasanian Empire kept the holy fire temples and knew the history of their religion. In a letter to a minor king Ardashir I overthrew but allowed to keep nominal power, Tansar explained some of his responsibilities and the piety of his king. The early Sasanian kings also fostered cultural continuity in non-religious ways, although like most pre-modern societies nearly every aspect of Sasanian culture was connected to religion in some way. One of the ways in which the early Sasanian kings linked themselves to the Achaemenid kings was by leaving inscriptions near the Achaemenid monuments, such as Naqash-i-Rustam and the Ka’ba Zardusht. The Ka’ba Zardusht, which was an Achaemenid era tower, became the favored place of Sasanian royal inscriptions. Like the Achaemenid kings hundreds of years earlier, the Sasanian kings left multi-lingual inscriptions on the tower, but instead of writing their messages in Old Persian, Akkadian, and Elamite as the Achaemenids had done, the Sasanians wrote their texts in Parthian, Middle Persian, and Greek. Interestingly, the later Sasanian kings did not follow the tradition of leaving inscriptions near Achaemenid monuments,  perhaps because they believed cultural continuity with earlier Persian dynasties was no longer important. 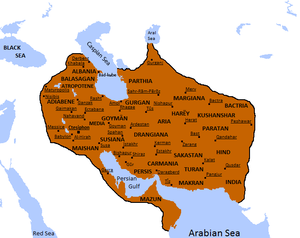 The Sasanian Empire was the third and final Persian empire of the pre-modern world. It came to power forcefully, through the conquests of Ardashir I, but its origins can be traced back much earlier. The Sasanians employed an incredible amount of administrative, religious, and cultural continuity with the previous Parthian and Achaemenid dynasties during the reigns of their first few rulers. Although the Sasanians overthrew their Parthian predecessors, they looked to them and the Achaemenids for inspiration and guidance, which ultimately helped them solidify their somewhat precarious political position early in the dynasty.